2 by its anatomical structure. 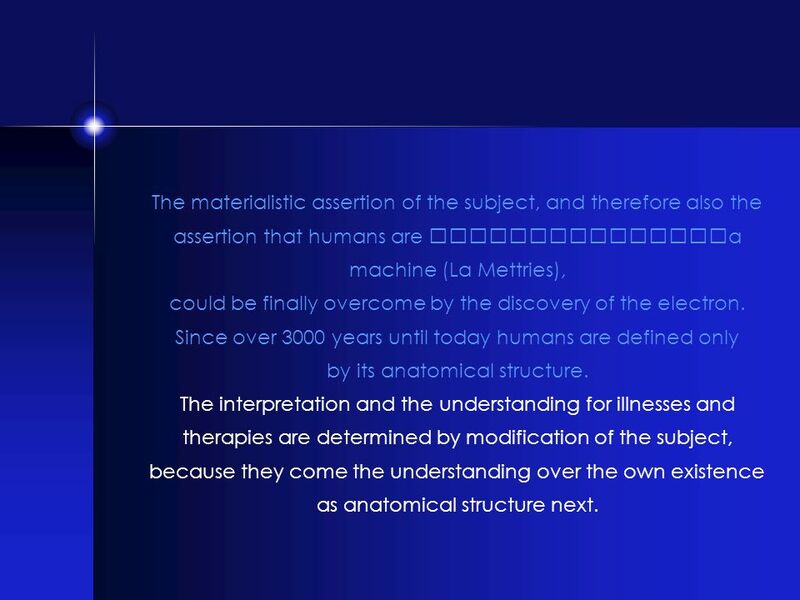 The materialistic assertion of the subject, and therefore also the assertion that humans are a machine (La Mettries), could be finally overcome by the discovery of the electron. Since over 3000 years until today humans are defined only by its anatomical structure. The interpretation and the understanding for illnesses and therapies are determined by modification of the subject, because they come the understanding over the own existence as anatomical structure next. of illnesses however last until today because the prevailing chemical and anatomical diagnostics leads to a quantification and a structuralisation of the disease pictures. 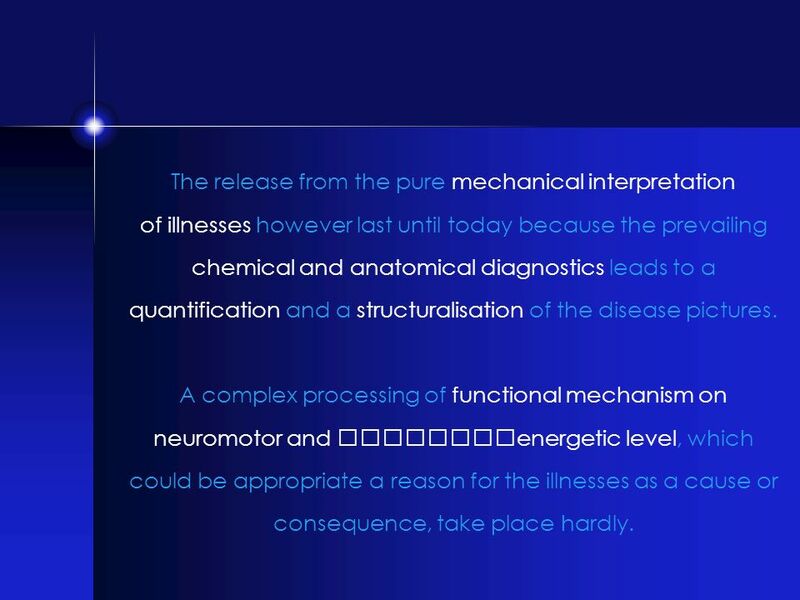 A complex processing of functional mechanism on neuromotor and energetic level, which could be appropriate a reason for the illnesses as a cause or consequence, take place hardly. 4 compensates chemical deficit. They enable a healing rarely. 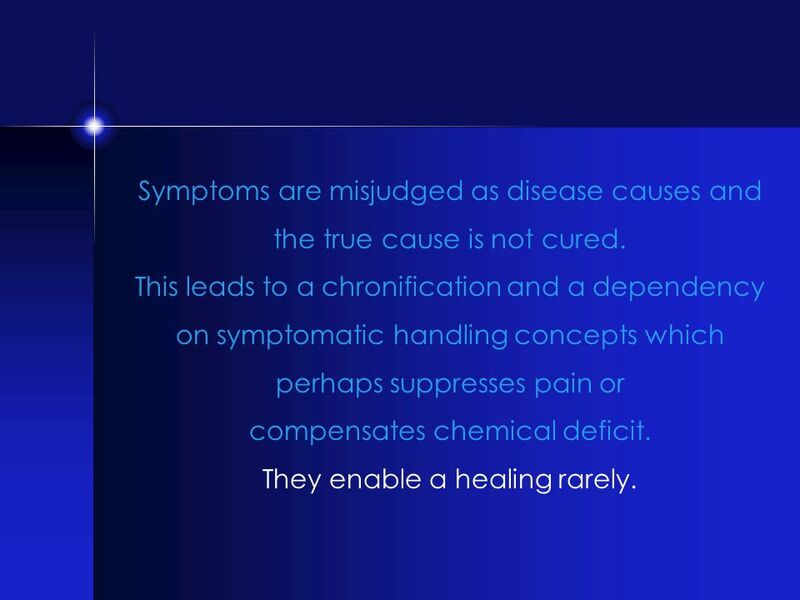 Symptoms are misjudged as disease causes and the true cause is not cured. This leads to a chronification and a dependency on symptomatic handling concepts which perhaps suppresses pain or compensates chemical deficit. They enable a healing rarely. 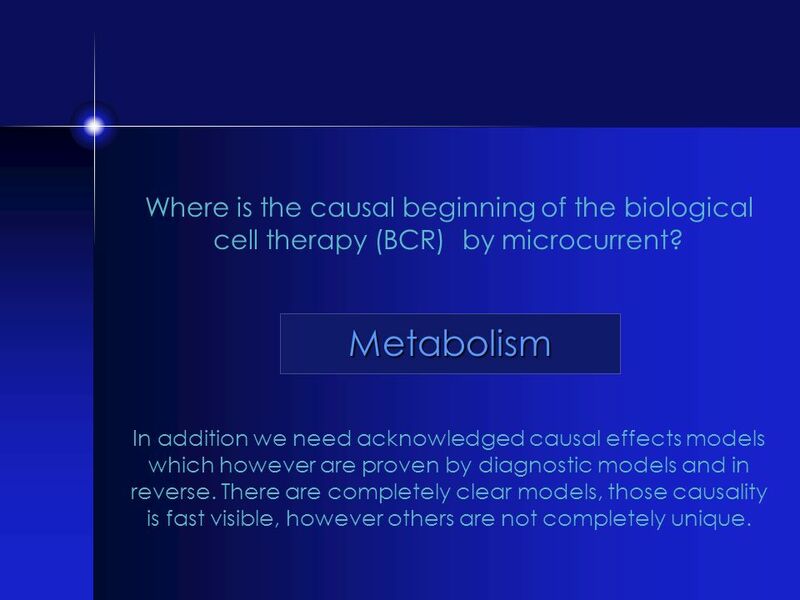 7 Where is the causal beginning of the biological cell therapy (BCR) by microcurrent? 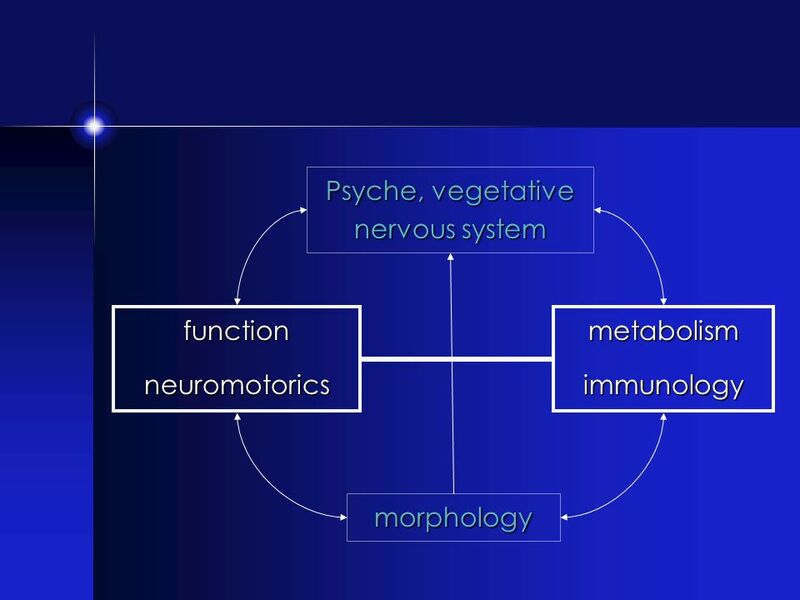 Metabolism In addition we need acknowledged causal effects models which however are proven by diagnostic models and in reverse. There are completely clear models, those causality is fast visible, however others are not completely unique. 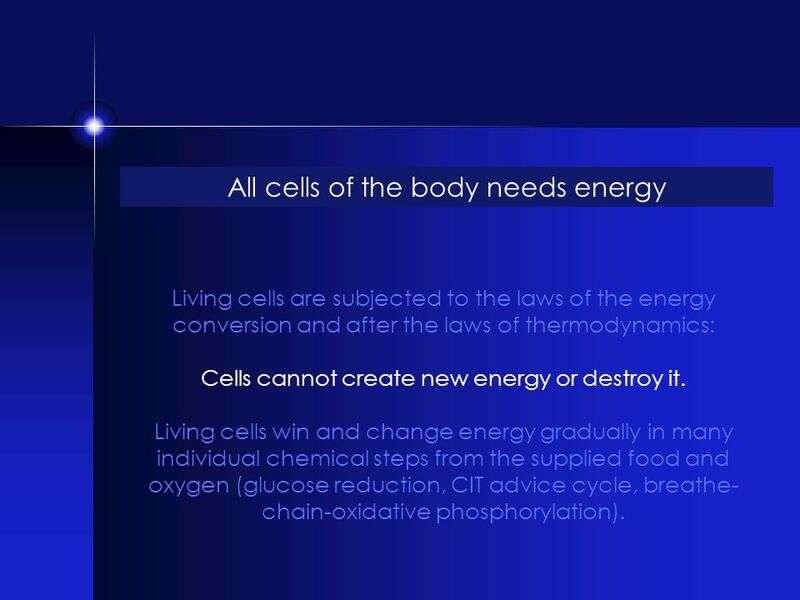 Living cells are subjected to the laws of the energy conversion and after the laws of thermodynamics: Cells cannot create new energy or destroy it. Living cells win and change energy gradually in many individual chemical steps from the supplied food and oxygen (glucose reduction, CIT advice cycle, breathe-chain-oxidative phosphorylation). 14 The most important process within an organism. 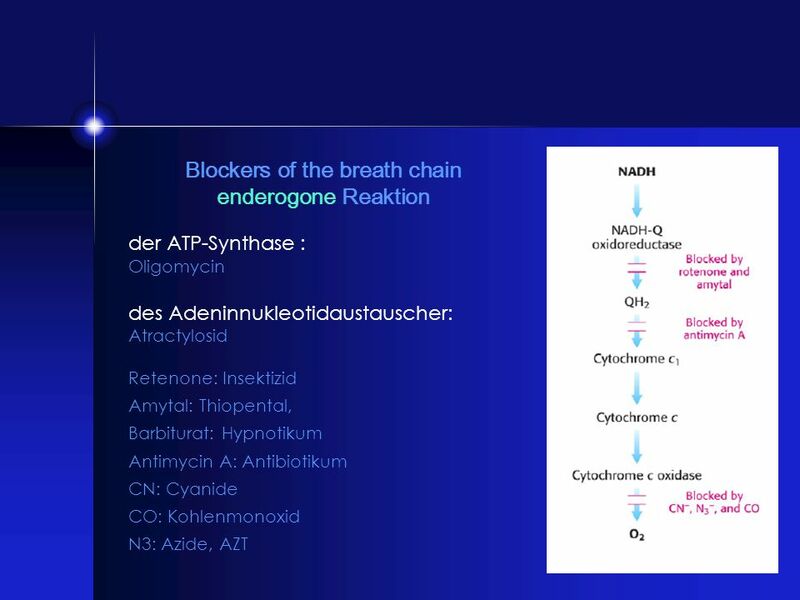 16 Processes, with which warmth is taken up, are endothermic or endergon. 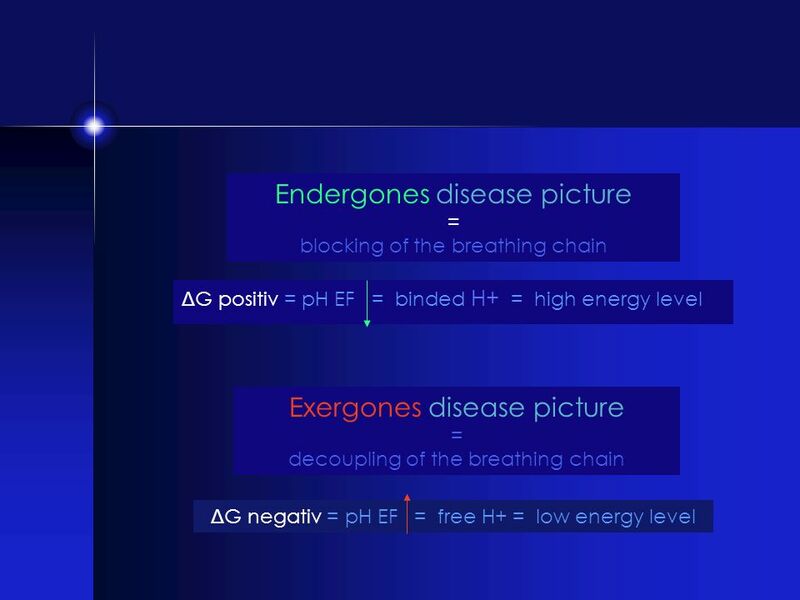 Energy balance of the system ΔG negative: Product energetically lower than the initial state, alltogether energy is delivered. If the released energy is not converted, the sample warms up, the reaction is exothermic or exergon. Warmth is delivered. 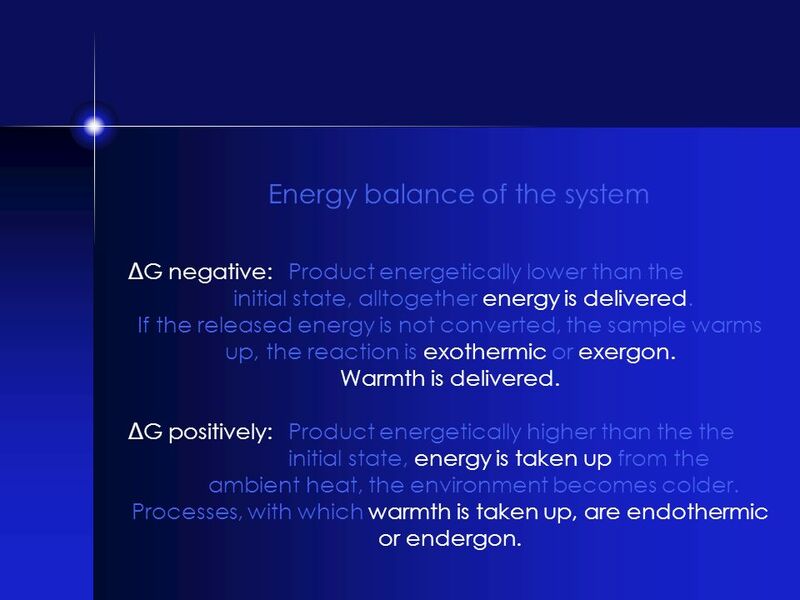 ΔG positively: Product energetically higher than the the initial state, energy is taken up from the ambient heat, the environment becomes colder. Processes, with which warmth is taken up, are endothermic or endergon. 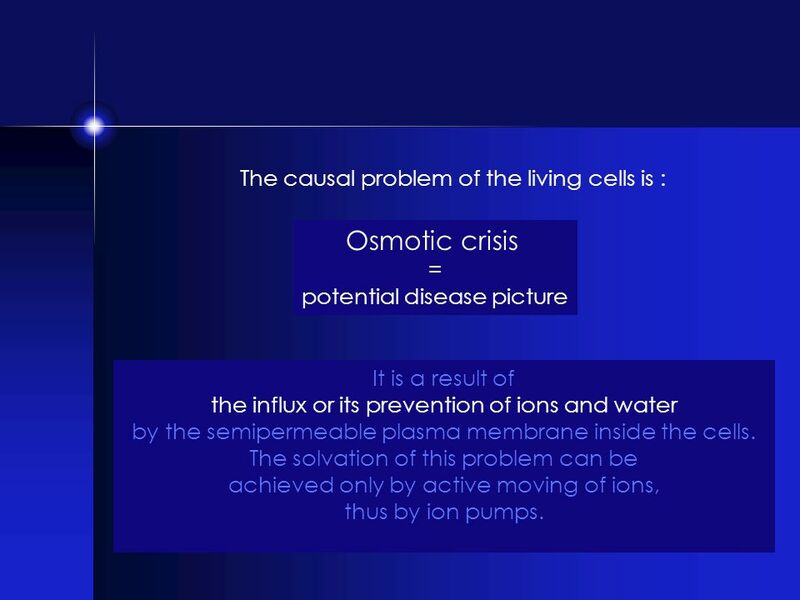 potential disease picture It is a result of the influx or its prevention of ions and water by the semipermeable plasma membrane inside the cells. 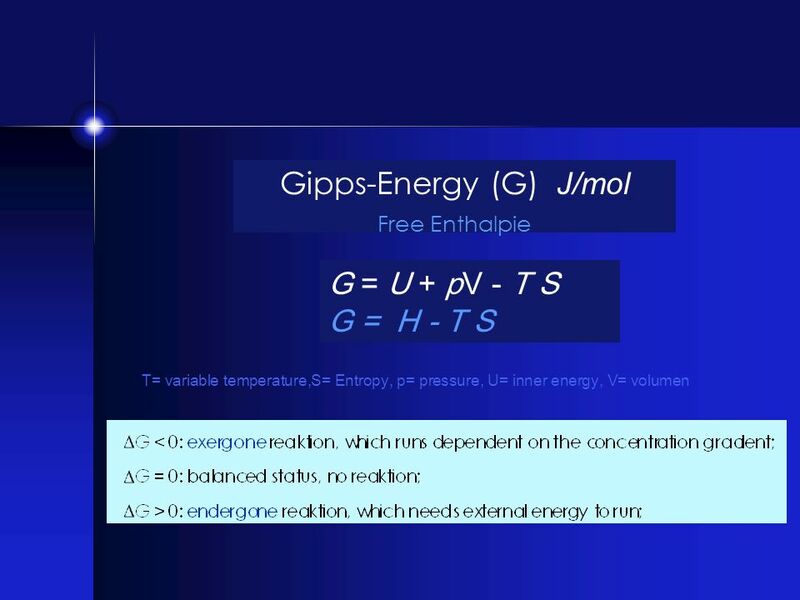 The solvation of this problem can be achieved only by active moving of ions, thus by ion pumps. Astumian RD University of Maine, Orono, Maine , USA. 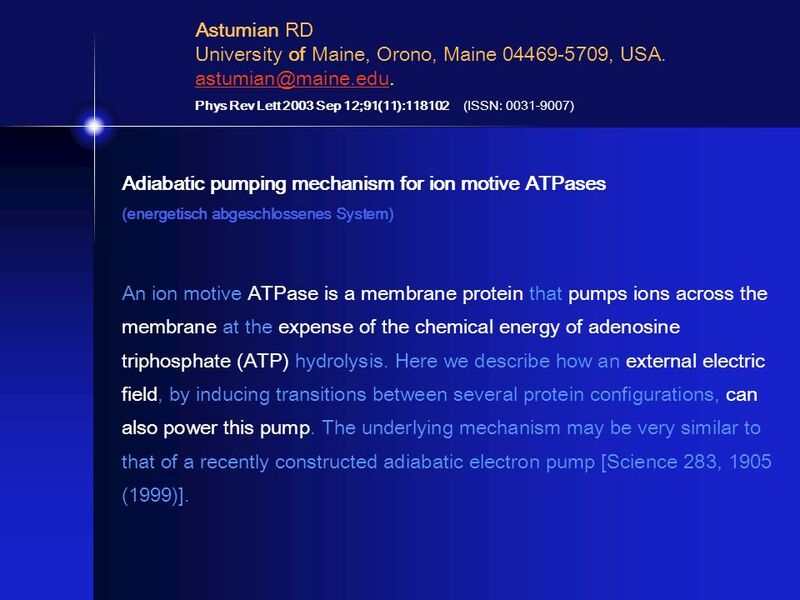 Phys Rev Lett 2003 Sep 12;91(11): (ISSN: ) Adiabatic pumping mechanism for ion motive ATPases (energetisch abgeschlossenes System) An ion motive ATPase is a membrane protein that pumps ions across the membrane at the expense of the chemical energy of adenosine triphosphate (ATP) hydrolysis. Here we describe how an external electric field, by inducing transitions between several protein configurations, can also power this pump. The underlying mechanism may be very similar to that of a recently constructed adiabatic electron pump [Science 283, 1905 (1999)]. 26 Towards a chemically driven molecular electron pump. Astumian RD, Derenyi I. Department of Physics, University of Maine, Orono, Maine , USA. Towards a chemically driven molecular electron pump. 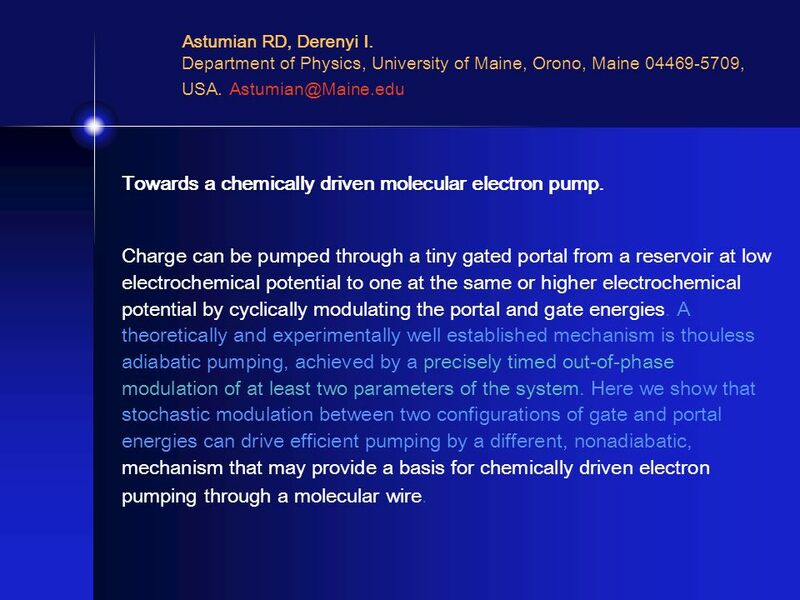 Charge can be pumped through a tiny gated portal from a reservoir at low electrochemical potential to one at the same or higher electrochemical potential by cyclically modulating the portal and gate energies. A theoretically and experimentally well established mechanism is thouless adiabatic pumping, achieved by a precisely timed out-of-phase modulation of at least two parameters of the system. Here we show that stochastic modulation between two configurations of gate and portal energies can drive efficient pumping by a different, nonadiabatic, mechanism that may provide a basis for chemically driven electron pumping through a molecular wire. 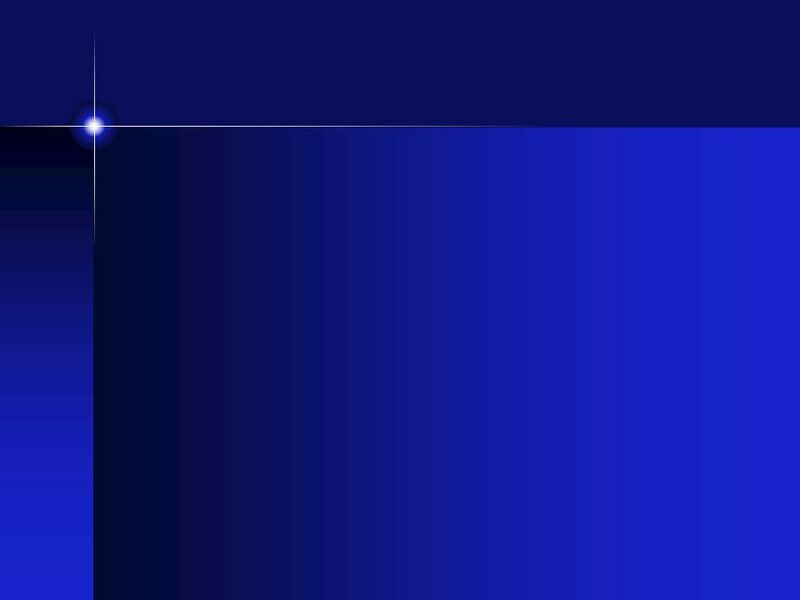 Beech JA , Bioelectromagnetics 1997;18(5):341-8 (ISSN: ) Bioelectric potential gradients may initiate cell cycling: ELF and zeta potential gradients may mimic this effect. 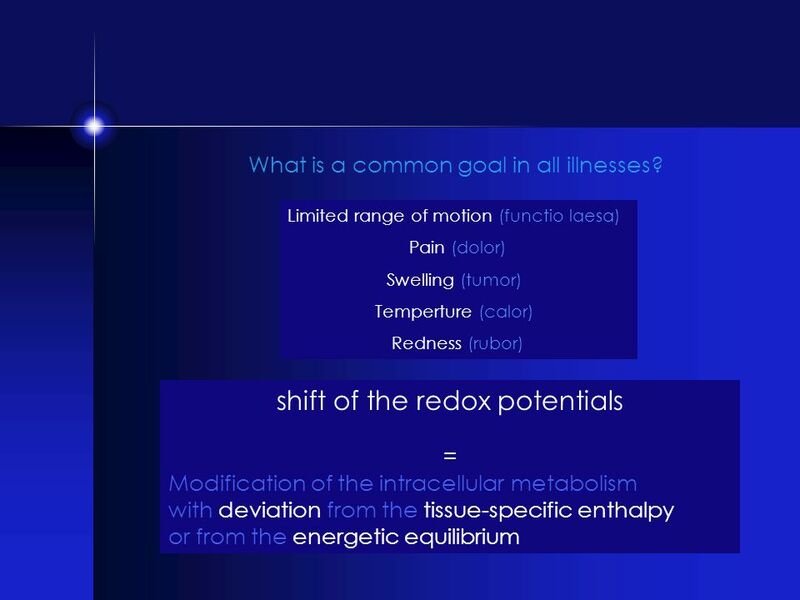 When a number of experimental studies in bioelectromagnetics were reviewed, those in which weak, exogenous extremely low frequency (ELF) fields were applied in fixed juxtaposition to their target tissues, were found to initiate mitogenesis or mitogenesis-related signals more successfully than when the target tissue moved freely during the irradiation. 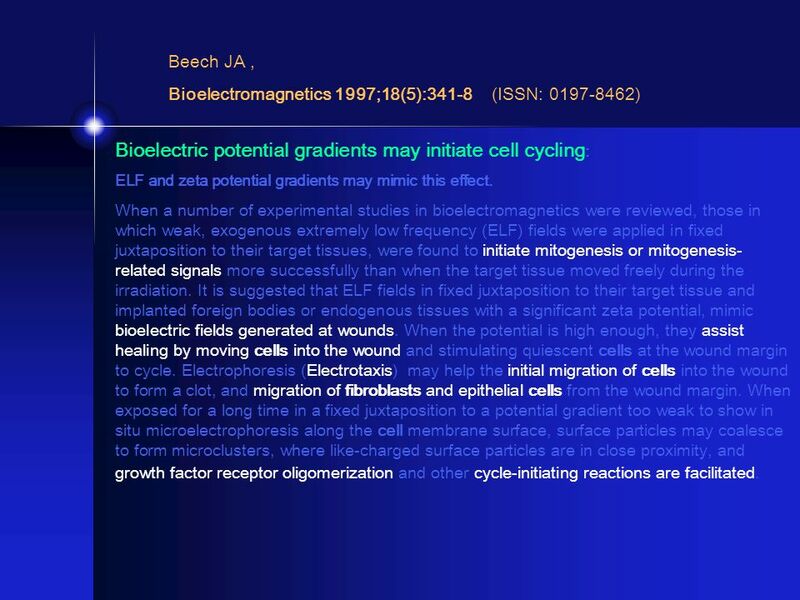 It is suggested that ELF fields in fixed juxtaposition to their target tissue and implanted foreign bodies or endogenous tissues with a significant zeta potential, mimic bioelectric fields generated at wounds. 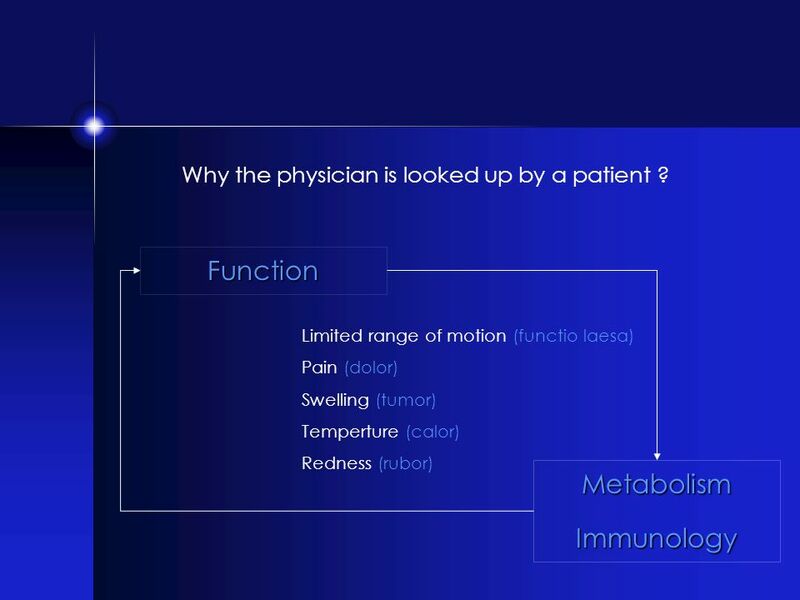 When the potential is high enough, they assist healing by moving cells into the wound and stimulating quiescent cells at the wound margin to cycle. Electrophoresis (Electrotaxis) may help the initial migration of cells into the wound to form a clot, and migration of fibroblasts and epithelial cells from the wound margin. When exposed for a long time in a fixed juxtaposition to a potential gradient too weak to show in situ microelectrophoresis along the cell membrane surface, surface particles may coalesce to form microclusters, where like-charged surface particles are in close proximity, and growth factor receptor oligomerization and other cycle-initiating reactions are facilitated. Tian Yow Tsong1, 3 , Dao-Sheng Liu1, Francoise Chauvin1 and R. Dean Astumian2 Department of Biological Chemistry, Johns Hopkins University School of Medicine, 21205 Baltimore, Maryland, USA, Department of Biochemistry, University of Minnesota College of Biological Sciences, 55108 St Paul, Minnesota, Laboratory of Biochemistry, National Heart, Lung and Blood Institute, NIH, 20892 Bethesda, Maryland, USA Resonance electroconformational coupling (ECC): A proposed mechanism for energy and signal transductions by membrane proteins Recent experiments show that membrane ATPases are capable of absorbing free energy from an applied oscillating electric field and converting it to chemical bond energy of ATP or chemical potential energy of concentration gradients. Presumably these enzymes would also respond to endogenous transmembrane electric fields of similar intensity and waveform. 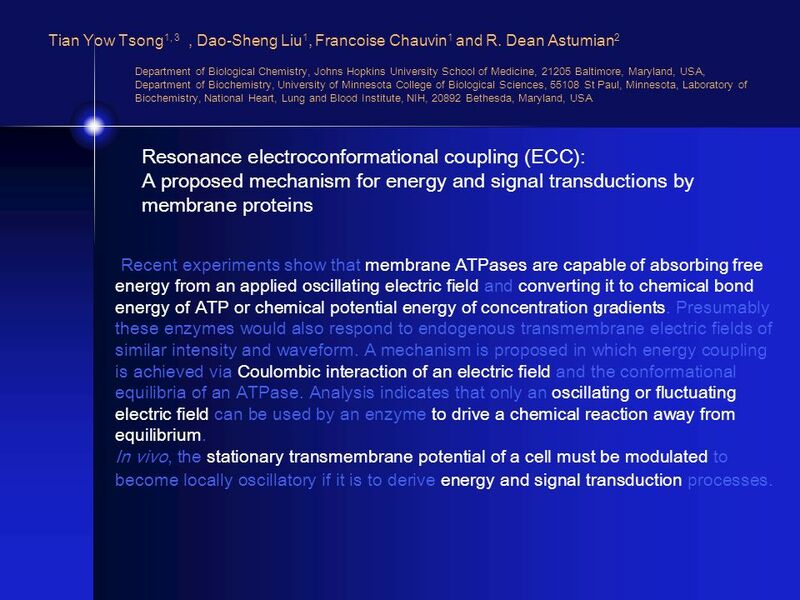 A mechanism is proposed in which energy coupling is achieved via Coulombic interaction of an electric field and the conformational equilibria of an ATPase. 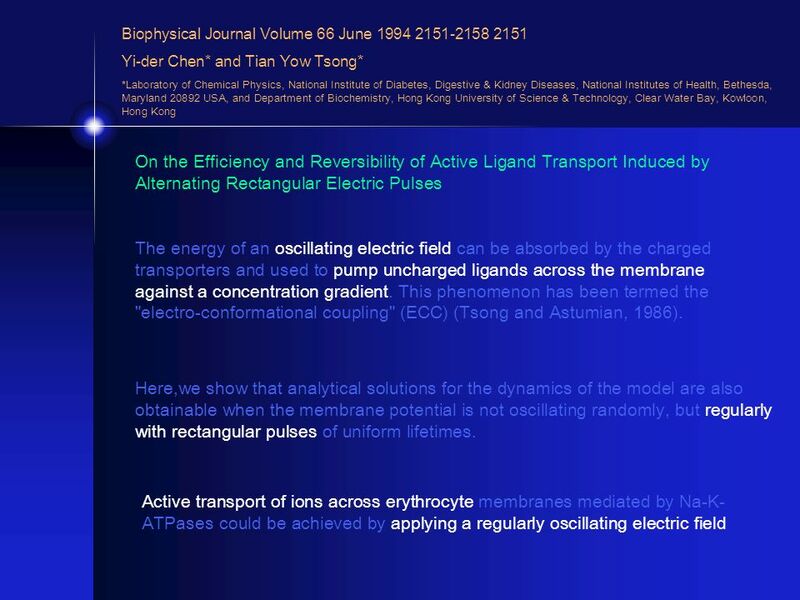 Analysis indicates that only an oscillating or fluctuating electric field can be used by an enzyme to drive a chemical reaction away from equilibrium. In vivo, the stationary transmembrane potential of a cell must be modulated to become locally oscillatory if it is to derive energy and signal transduction processes. 30 Lambert MI; Marcus P; Burgess T; Noakes TD MRC/UCT Research Unit for Exercise Science and Sports Medicine, P.O. Box 115, Newlands, South Africa. 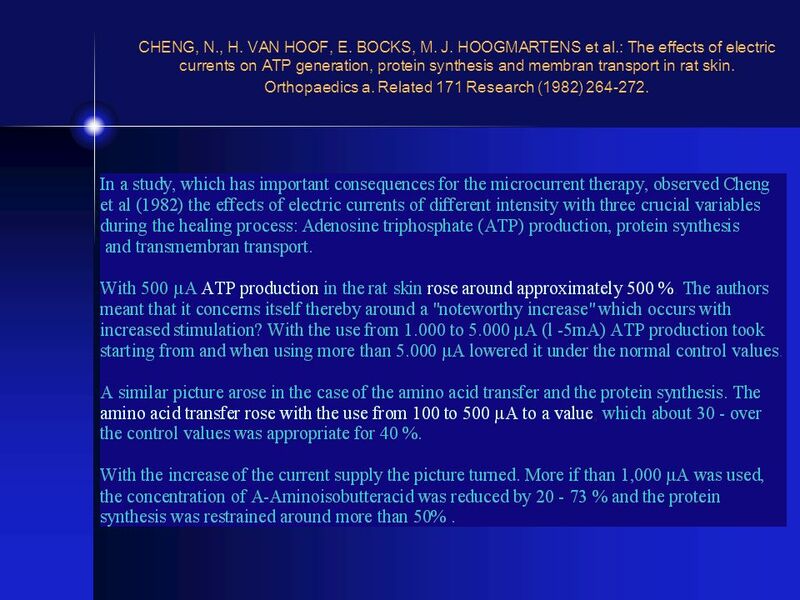 Med Sci Sports Exerc 2002 Apr;34(4):602-7 (ISSN: ) Electro-membrane microcurrent therapy reduces signs and symptoms of muscle damage. Delayed onset muscle soreness (DOMS) occurs after unaccustomed physical activity or competitive sport, resulting in stiff, painful muscles with impaired function. Electro-membrane microcurrent therapy has been used to treat postoperative pain and soft tissue injury. RESULTS: Subjects in both groups experienced severe pain and swelling of the elbow flexors after the eccentric exercise. After 24 h, the elbow joint angle of the placebo group had increased significantly more than those in the MENS group (13.7 +/- 8.9 degrees vs 7.5 +/- 5.5 degrees; placebo vs MENS, P < 0.05), possibly as a consequence of the elbow flexor muscles shortening. For the first 48 h after exercise, maximum voluntary contraction of the elbow flexor muscles was significantly impaired in the placebo group by up to 25% (P < 0.05), whereas muscle function was unchanged in the MENS group. Peak plasma creatine kinase activity was also lower in the MENS group (peak = 777 +/ U.L-1) versus the placebo group (peak = / U.L-1; (P < 0.05). 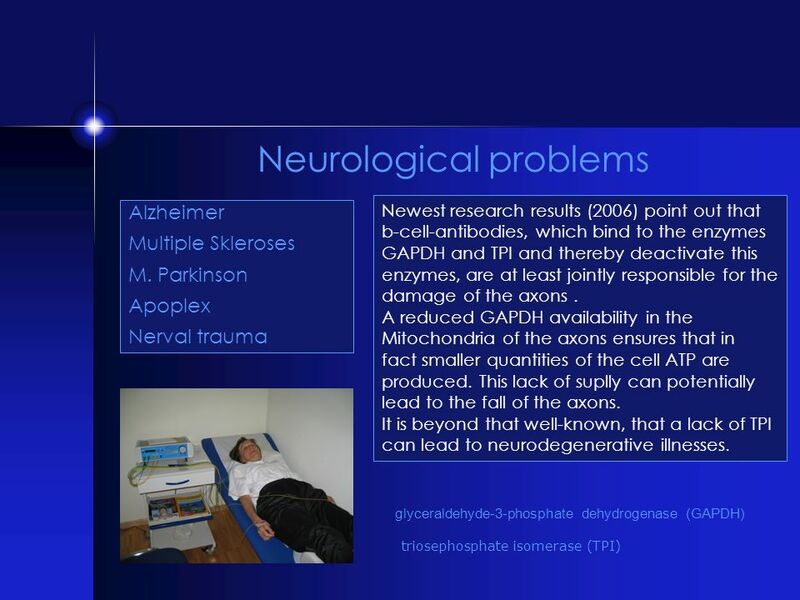 The membranes were well tolerated by the subjects in both groups without any adverse effects. 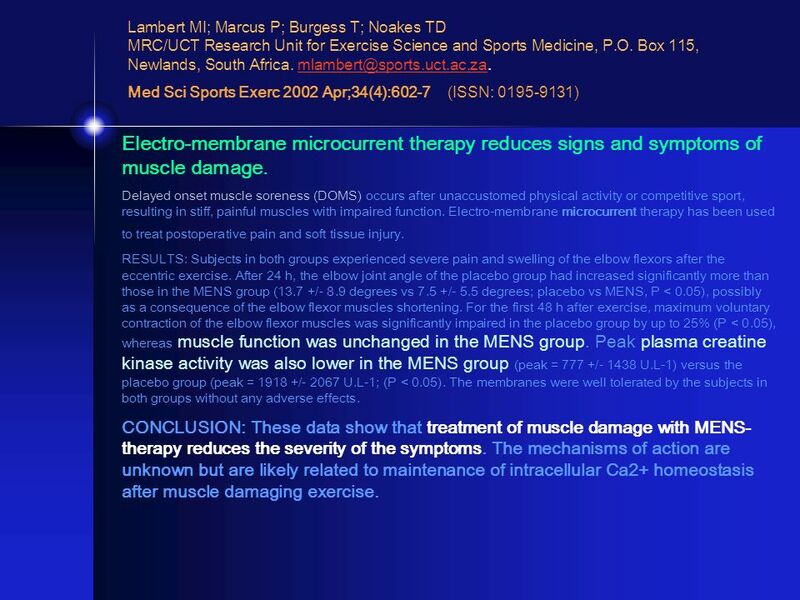 CONCLUSION: These data show that treatment of muscle damage with MENS-therapy reduces the severity of the symptoms. 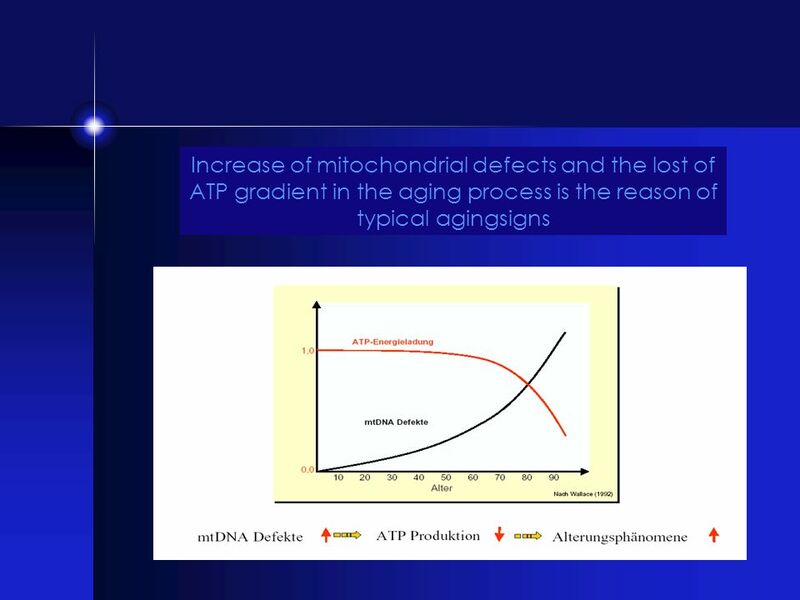 The mechanisms of action are unknown but are likely related to maintenance of intracellular Ca2+ homeostasis after muscle damaging exercise. 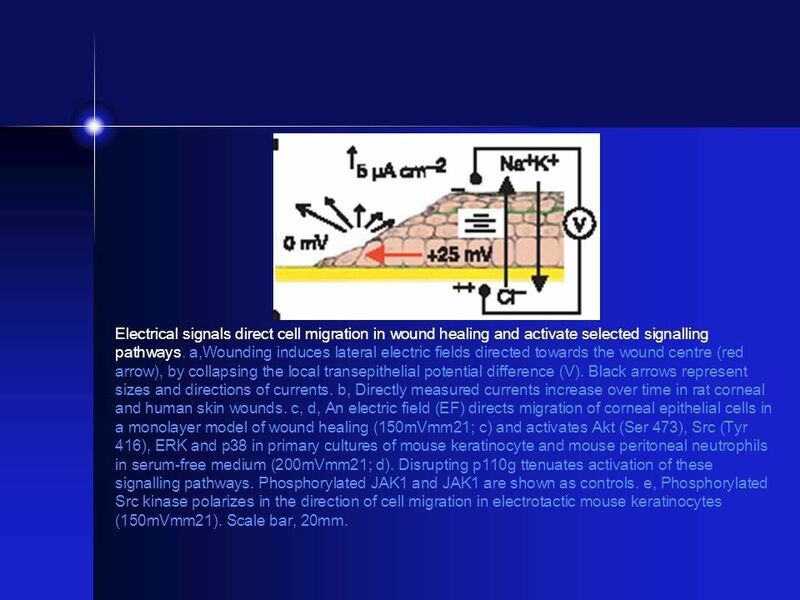 32 Electrical signals direct cell migration in wound healing and activate selected signalling pathways. a,Wounding induces lateral electric fields directed towards the wound centre (red arrow), by collapsing the local transepithelial potential difference (V). Black arrows represent sizes and directions of currents. b, Directly measured currents increase over time in rat corneal and human skin wounds. c, d, An electric field (EF) directs migration of corneal epithelial cells in a monolayer model of wound healing (150mVmm21; c) and activates Akt (Ser 473), Src (Tyr 416), ERK and p38 in primary cultures of mouse keratinocyte and mouse peritoneal neutrophils in serum-free medium (200mVmm21; d). 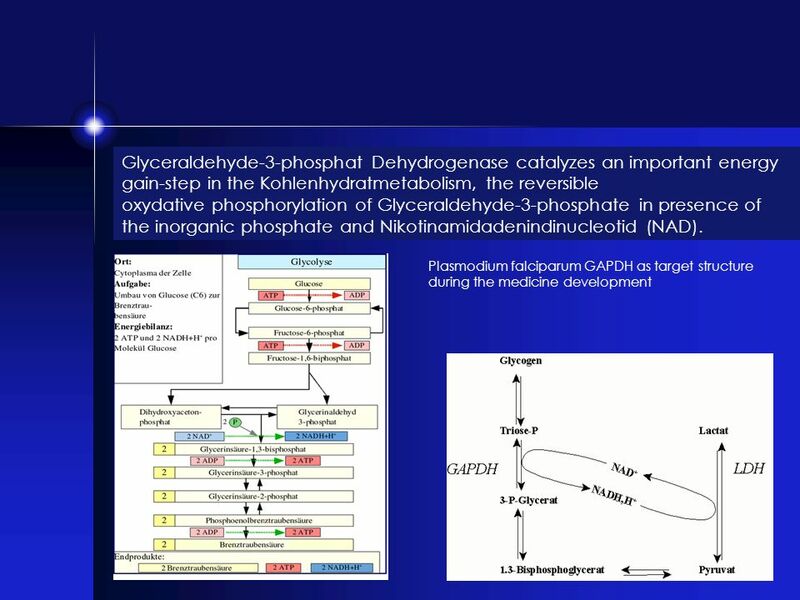 Disrupting p110g ttenuates activation of these signalling pathways. 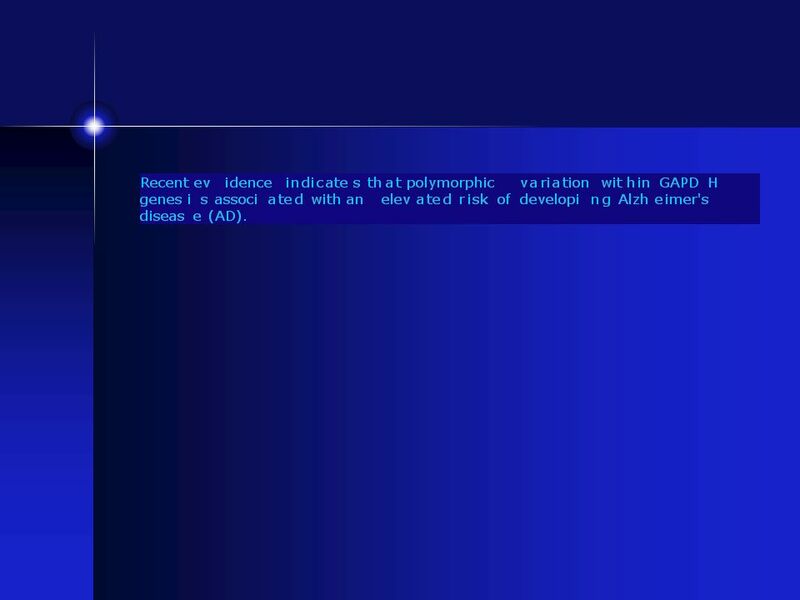 Phosphorylated JAK1 and JAK1 are shown as controls. e, Phosphorylated Src kinase polarizes in the direction of cell migration in electrotactic mouse keratinocytes (150mVmm21). Scale bar, 20mm. 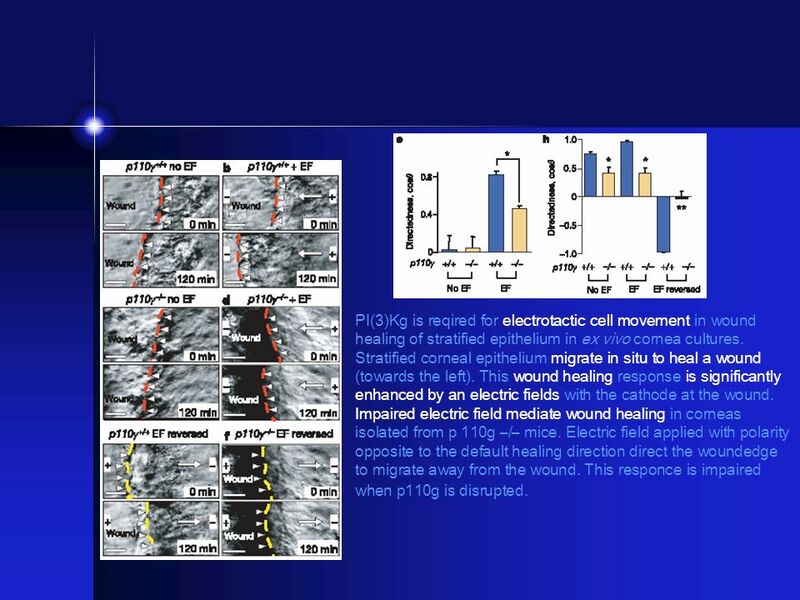 33 PI(3)Kg is reqired for electrotactic cell movement in wound healing of stratified epithelium in ex vivo cornea cultures. Stratified corneal epithelium migrate in situ to heal a wound (towards the left). 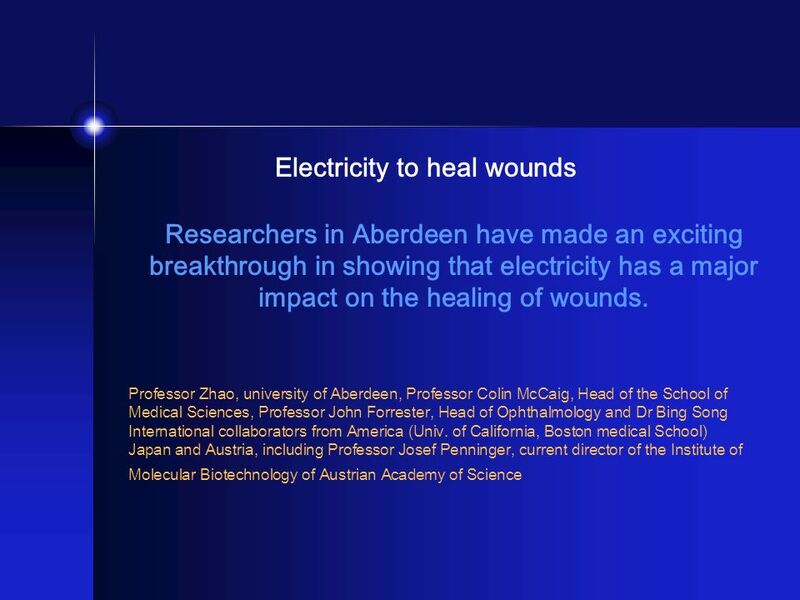 This wound healing response is significantly enhanced by an electric fields with the cathode at the wound. 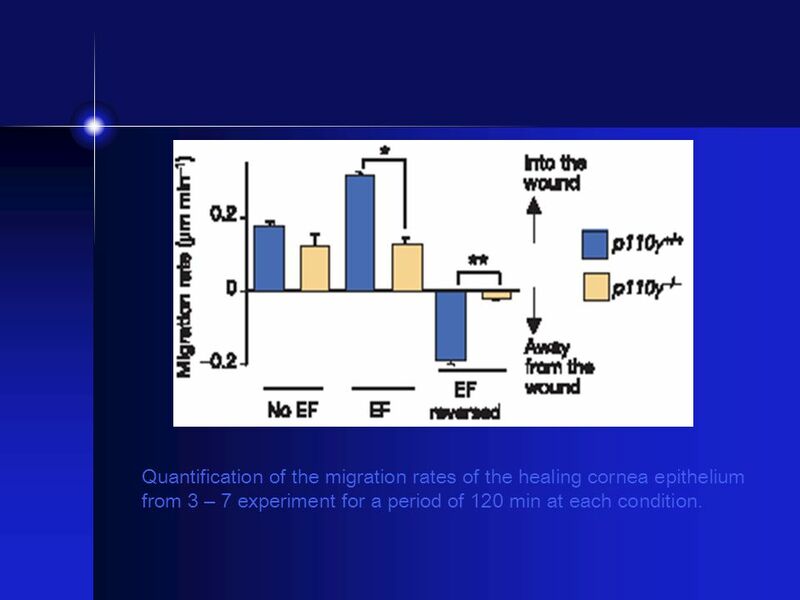 Impaired electric field mediate wound healing in corneas isolated from p 110g –/– mice. Electric field applied with polarity opposite to the default healing direction direct the woundedge to migrate away from the wound. This responce is impaired when p110g is disrupted. 34 Quantification of the migration rates of the healing cornea epithelium from 3 – 7 experiment for a period of 120 min at each condition. 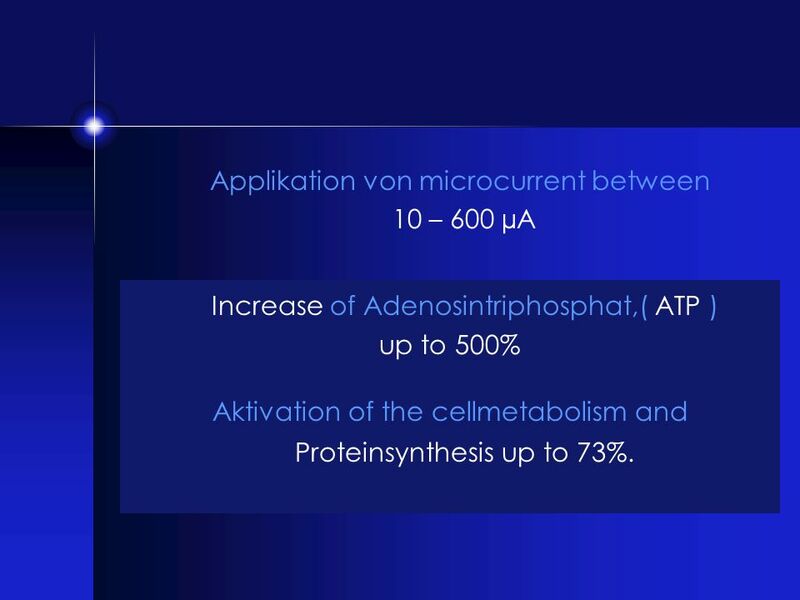 Applikation von microcurrent between 10 – 600 µA Increase of Adenosintriphosphat,( ATP ) up to 500% Aktivation of the cellmetabolism and Proteinsynthesis up to 73%. 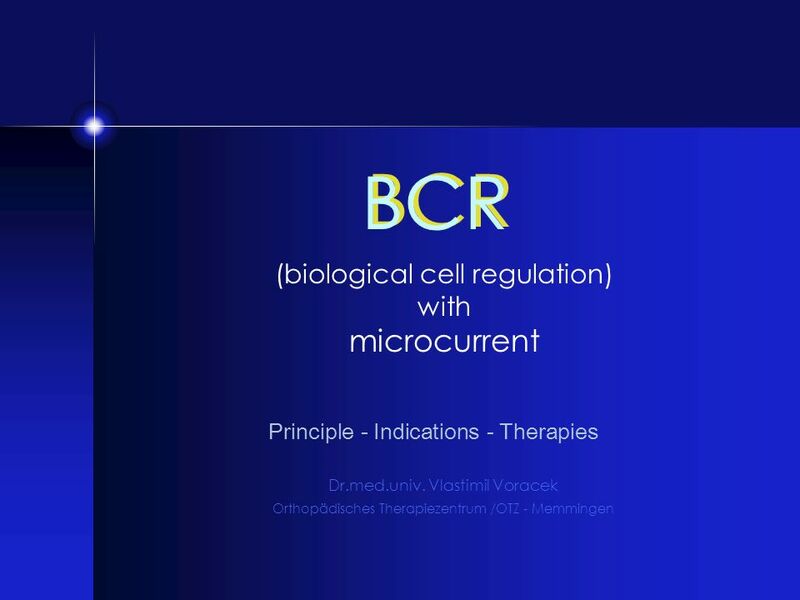 Download ppt "BCR microcurrent (biological cell regulation) with"
First Anatomy and Physiology quiz/test on MONDAY!!! 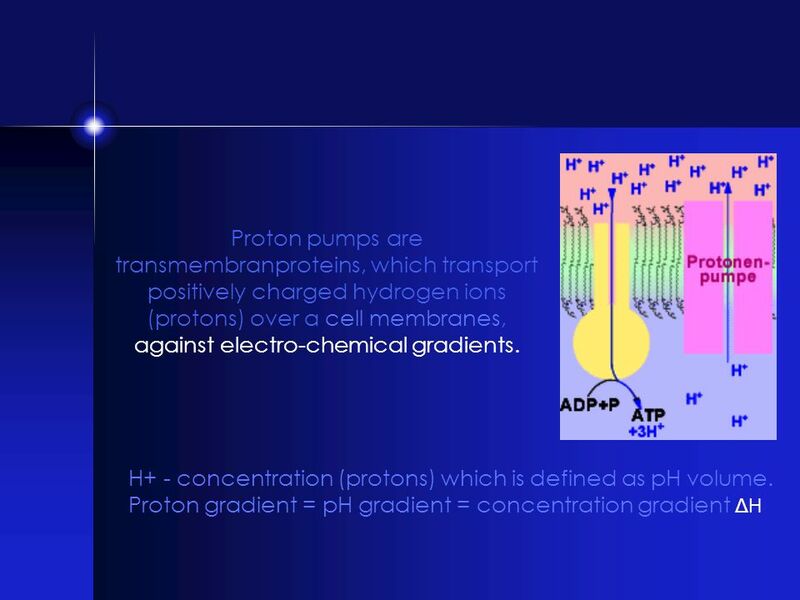 Electron Transport Lecture 24 Chapter 14. Q1 How many steps constitute the citric acid cycle? A) 2 B) 4 C) 6 D) 8 E) 10. 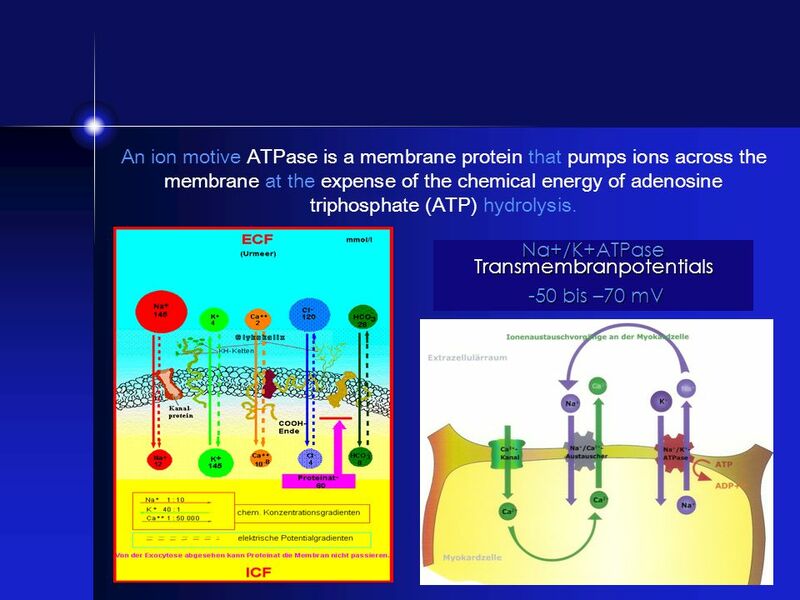 Membrane proteins ECB Fig Membrane proteins have a variety of functions. 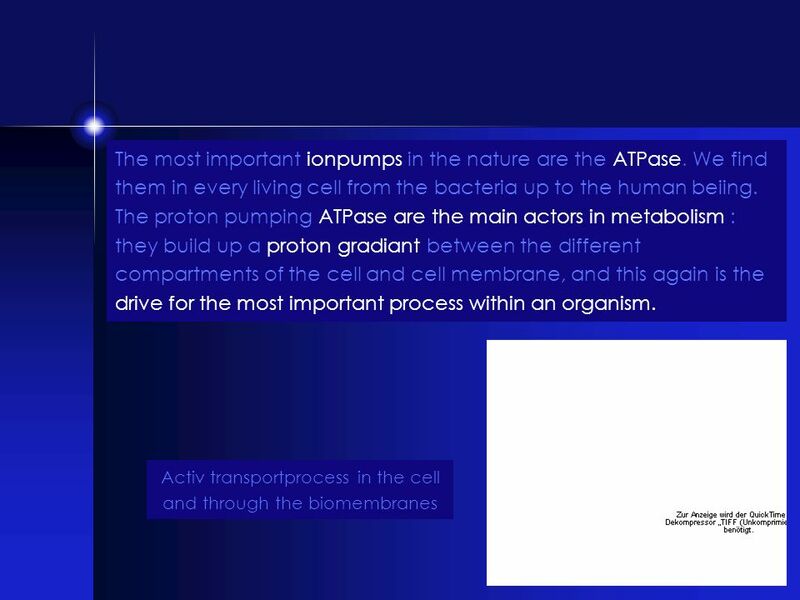 Membrane transport: The set of transport proteins in the plasma membrane, or in the membrane of an intracellular organelle, determines exactly what solutes. 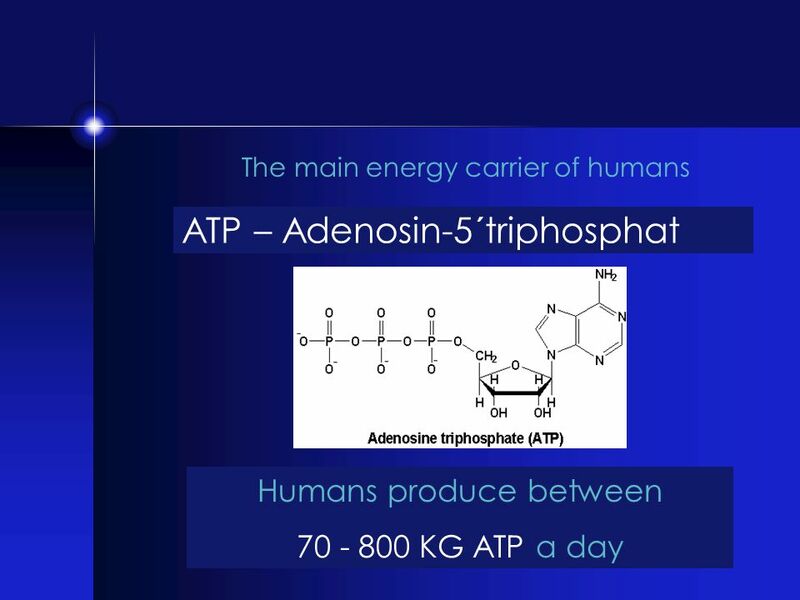 Energy Transfer & Systems The energy needs of life Organisms are endergonic systems – What do we need energy for? 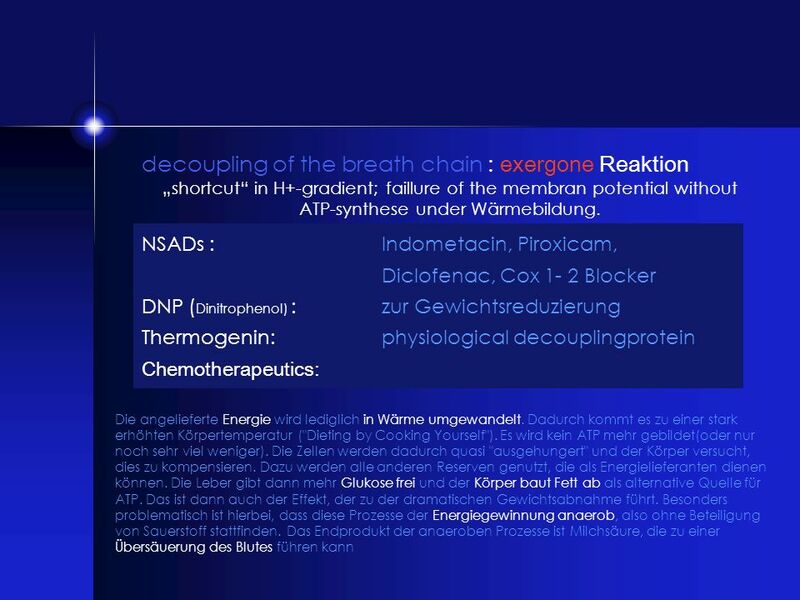 synthesis (new cells, tissues…) reproduction. 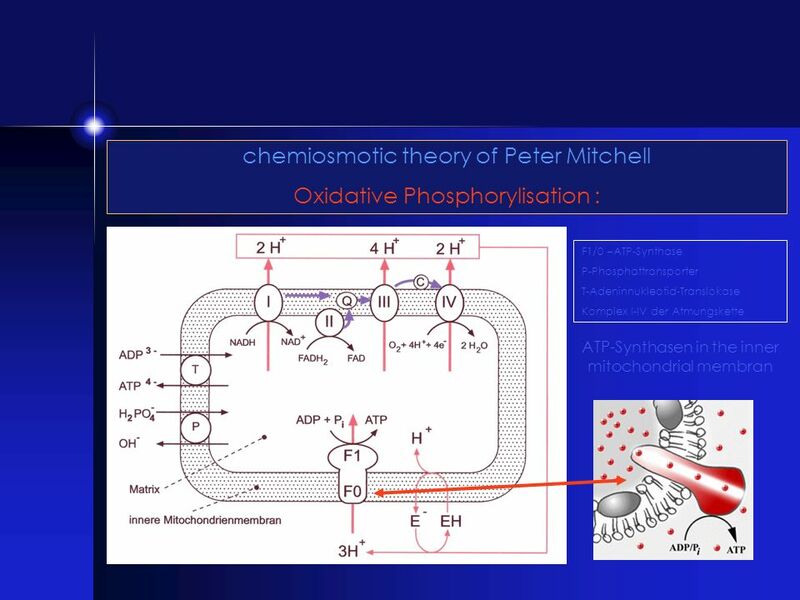 UNIT 2 Chapter 6: A Tour of the Cell Chapter 7: Membrane Structure & Function Chapter 8: An Introduction to Metabolism. CELLULAR RESPIRATION BIOLOGY IB/ SL Option C.3. 6 Energy, Enzymes, and Metabolism. 6 Energy and Energy Conversions To physicists, energy represents the capacity to do work. 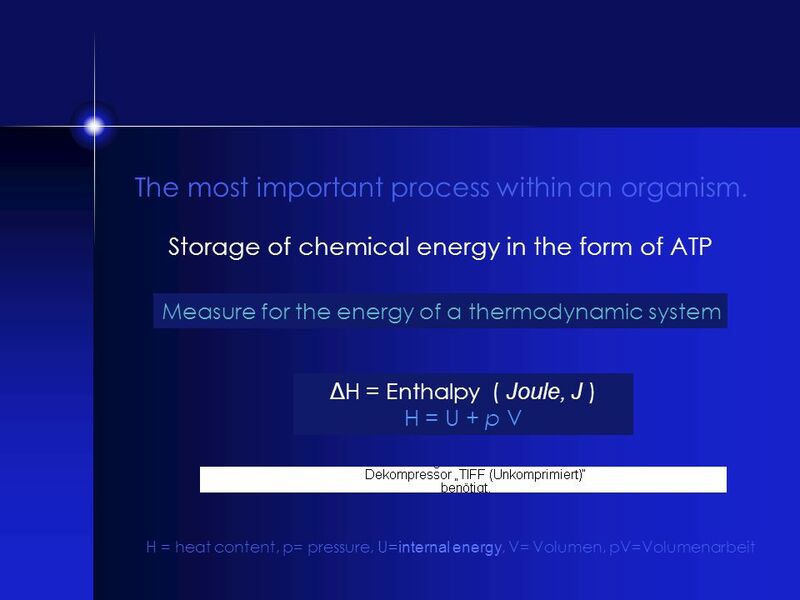 To biochemists, energy represents.